German Expressionism refers to a number of related creative movements beginning in Germany before the First World War that reached a peak in Berlin, during the 1920s. These developments in Germany were part of a larger Expressionist movement in north and central European culture in fields such as architecture, painting and cinema. German Expressionist painting produced a great number of works, and led to Neo-expressionism. In 1905, a group of four German artists, led by Ernst Ludwig Kirchner, formed Die Brücke (the Bridge) in the city of Dresden. This was arguably the founding organization for the German Expressionist movement, though they did not use the word itself. 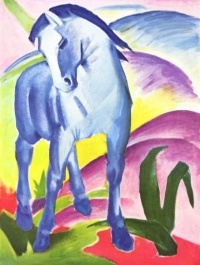 A few years later, in 1911, a like-minded group of young artists formed Der Blaue Reiter (The Blue Rider) in Munich. The name came from Wassily Kandinsky's Der Blaue Reiter painting of 1903. Among their members were Kandinsky, Franz Marc, Paul Klee, and Auguste Macke. However, the term Expressionism did not firmly establish itself until 1913. Among the first Expressionist films, The Student of Prague (1913), The Cabinet of Dr. Caligari (1920), The Golem: How He Came Into the World (1920), Destiny (1922), Nosferatu (1922), Phantom (1922), Schatten (1923), and The Last Laugh (1924), were highly symbolic and stylized. The German Expressionist movement was largely confined to Germany due to the isolation the country experienced during World War I. In 1916, the government had banned more foreign films in the nation. The demand from theaters to generate films led film production to rise from 24 films (1914) to 130 films (1918). With inflation on the rise, Germans were attending films more freely because they knew that their money's worth was constantly diminishing. Besides the films' popularity within Germany, by 1922 the international audience had begun to appreciate German cinema, in part due to a decreasing anti-German sentiment following the end of World War I. By the time the 1916 ban on imports was lifted, Germany had become a part of the international film industry. Various European cultures of the 1920s embraced an ethic of change, and a willingness to look to the future by experimenting with bold, new ideas and artistic styles. The first Expressionist films made up for a lack of lavish budgets by using set designs with wildly non-realistic, geometrically absurd sets, along with designs painted on walls and floors to represent lights, shadows, and objects. The plots and stories of the Expressionist films often dealt with madness, insanity, betrayal, and other "intellectual" topics (as opposed to standard action-adventure and romantic films). Later films often categorized as part of the brief history of German Expressionism include Metropolis (1927) and M (1931), both directed by Fritz Lang. This trend was a direct reaction against realism. Its practitioners used extreme distortions in expression to show an inner emotional reality rather than what is on the surface. The extreme anti-realism of Expressionism was short-lived, fading away after only a few years. However, the themes of Expressionism were integrated into later films of the 1920s and 1930s, resulting in an artistic control over the placement of scenery, light, etc. to enhance the mood of a film. This dark, moody school of film making was brought to the United States when the Nazis gained power and a number of German filmmakers emigrated to Hollywood. These German directors found U.S. movie studios willing to embrace them, and several German directors and cameramen flourished there, producing a repertoire of Hollywood films that had a profound effect on film as a whole. Two genres that were especially influenced by Expressionism are horror film and film noir. Carl Laemmle and Universal Studios had made a name for themselves by producing such famous horror films of the silent era as Lon Chaney's The Phantom of the Opera. German filmmakers such as Karl Freund (the cinematographer for Dracula in 1931) set the style and mood of the Universal monster movies of the 1930s with their dark and artistically designed sets, providing a model for later generations of horror films. Directors such as Fritz Lang, Billy Wilder, Otto Preminger, Alfred Hitchcock, Orson Welles, Carol Reed and Michael Curtiz introduced the Expressionist style to crime dramas of the 1940s, expanding Expressionism's influence on modern film making. German silent cinema was arguably far ahead of cinema in Hollywood. As well as the direct influence of film makers who moved from Germany to Hollywood, developments in style and technique, which were developed through Expressionism in Germany impressed contemporary film makers from elsewhere and were incorporated into their work and so into the body of international cinema from the 1930s onward. A good example of this process can be found in the career of the British director Alfred Hitchcock. In 1924, Hitchcock was sent by his film company Gainsborough Pictures to work as an assistant director and art director at the UFA Babelsberg Studios in Berlin on the film The Blackguard. An immediate effect of the working environment there can be seen in his expressionistic set designs for The Blackguard. The influence can also be seen throughout the rest of Hitchcock's career. In his third film, The Lodger, Hitchcock introduced Expressionist set designs, lighting techniques, and trick camera work (such as the image of a man walking across a glass floor shot from below, a concept representing someone pacing upstairs) to the British public against the wishes of his studio. In his later films, this influence continued through his visual experimentation. For example, in the shower scene from Psycho, Norman Bates' blurred image seen through a shower curtain is reminiscent of Nosferatu shown through his shadow. The development of these themes and techniques are not coincidental. Hitchcock said, "I have acquired a strong German influence by working at the UFA studios Berlin". Hitchcock's film making has in its turn influenced many other film makers and so has been one of the vehicles which have propelled German Expressionist techniques into the present day. Expressionism has also had an influence on contemporary films. For example Dark City is influenced by German Expressionism's stark contrast, rigid movements, and fantastic elements. Werner Herzog's 1979 film Nosferatu: Phantom der Nacht was a tribute to F. W. Murnau's 1922 film. The film uses Expressionist techniques of highly symbolic acting and symbolic events to tell its story. Notably it links the vampire myth with the black death through the use of black rats. One may even notice the link between the evil character of the vampire portrayed by Klaus Kinski, and Nosferatu's star, Max Schreck. Stylistic elements taken from German Expressionism are common today in films that do not need reference to real places such as science fiction films (for example, Ridley Scott's 1982 film Blade Runner, which was itself influenced by Metropolis). Woody Allen's 1991 film Shadows and Fog is an homage to German Expressionist filmmakers Fritz Lang, Georg Wilhelm Pabst and F. W. Murnau. Ambitious adaptations of the style are depicted throughout the contemporary filmography of director Tim Burton. His 1992 film Batman Returns is often cited as a modern attempt to capture the essence of German Expressionism. The angular building designs and severe-looking city squares of Gotham City evoke the loom and menace present in Lang's Metropolis. Burton's influences are most apparent in the fairy tale suburban landscape of Edward Scissorhands. The appearance of the titular Edward Scissorhands (not accidentally) reflects Caligari 's somnambulist servant. Burton casts unease in his candy-colored suburb, and the tension is visually unmasked through Edward and his Gothic castle. Burton subverts the Caligari nightmare with an inspired narrative branding, casting the garish somnambulist as the hero and the villagers as the villains. Similarly, Dr. Caligari was the inspiration for the grotesque, bird-like appearance of The Penguin in Burton's 1992 film Batman Returns. The familiar look of Caligari's main character can also be seen in the movie The Crow. With the tight, black outfit, white make-up and darkened eyes, Brandon Lee's character is a close relative to both Cesare and to Burton's film Edward Scissorhands. Burton was also reportedly influenced by silent films and German Expressionism for his film adaptation of the musical Sweeney Todd: The Demon Barber of Fleet Street, describing the musical as a "silent film with music". Many critics see a direct tie between cinema and architecture of the time, stating that the sets and scene artwork of Expressionist films often reveal buildings of sharp angles, great heights, and crowded environments, such as the frequently shown Tower of Babel in Fritz Lang’s Metropolis. Strong elements of monumentalism and modernism appear throughout the canon of German Expressionism. An excellent example on this is Metropolis, as evidenced by the enormous power plant and glimpses of the massive yet pristine 'upper' city. Expressionist paintings avoided the use of subtle shadings and colors. They often used large shapes of bright, unrealistic colors with dark,and they were often cartoon-like. Buildings might sag or lean, showing the ground tilted up steeply. German Expressionist films produced in the Weimar Republic immediately following the First World War not only encapsulate the sociopolitical contexts in which they were created, but also rework the intrinsically modern problems of self-reflexivity, spectacle and identity. Robert Wiene's silent film The Cabinet of Dr. Caligari (1919) is universally recognized as an early classic of Expressionist cinema. Following the esteemed critiques of Siegfried Kracauer and Lotte Eisner, these films are now viewed as a kind of collective consciousness, so inherently tied are they to their social milieu. Briefly mentioned by J. P. Telotte in his analysis of German film, “German Expressionism: A Cinematic/ Cultural Problem”, expressionism focuses on the “power of spectacles” and offers audiences “a kind of metonymic image of their own situation”. This film movement paralleled Expressionist painting and theater in rejecting realism. The creators of the time sought to convey inner, subjective experience through external, objective means. Their films were characterized by highly stylized sets and acting; they used a new visual style which embodied high contrast and simple editing. The films were shot in studios where they could employ deliberately exaggerated and dramatic lighting and camera angles to emphasize some particular affect - fear, horror, pain. Aspects of Expressionist techniques were later adapted by such directors as Alfred Hitchcock and Orson Welles and were incorporated into many American gangster and horror films. Some of the major filmmakers of this time were F.W. Murnau, Erich Pommer, and Fritz Lang. The movement ended after the currency stabilized, making it cheaper to buy movies abroad. The UFA financially collapsed and German studios began to deal with Italian studios which led to their influence in style of horror and films noir. The American influence on the film industry would also leed some film makers to continue their career in the US. Two works about the era are Lotte Eisner's The Haunted Screen and Sigfried Kracauer's From Caligari to Hitler. Kracauer examines German cinema from the Silent/Golden Era and eventually concludes that German films made prior to Hitler's takeover and the rise of the Third Reich all hint at the inevitability of Nazi Germany. For Eisner, German Expressionist cinema is a visual manifestation of Romantic ideals. She closely examines staging, cinematography, acting, scenarios, and other cinematic elements in films by Pabst, Lubitsch, Lang (her obvious favorite), Riefenstahl, Harbou, and Murnau. More recent German Expressionist scholars examine historical elements of German Expressionism, such as inflation/economics, UFA, Erich Pommer, Nordisk, and Hollywood. Unless indicated otherwise, the text in this article is either based on Wikipedia article "German Expressionism" or another language Wikipedia page thereof used under the terms of the GNU Free Documentation License; or on original research by Jahsonic and friends. See Art and Popular Culture's copyright notice. This page was last modified 10:56, 5 February 2015. This page has been accessed 15,004 times.